In the treasured moments after a mother gives birth, another life-giving opportunity is available inside the hospital delivery room. 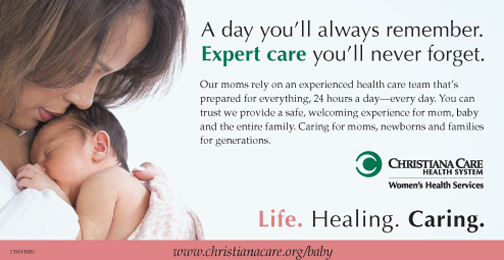 Mothers delivering at Christiana Care Health System can make their baby’s birth even more special by donating their baby’s umbilical cord blood. By electing to donate their newborn’s cord blood, the new mother can help patients across the nation struggling with chronic illnesses as well as diseases for which no cure exists. In obtaining the sample, no physical contact occurs with either the mother or newborn. Consider the banking of blood from the umbilical cord – the part of the placenta that transports nutrients to the fetus – as a form of recycling that both saves and improves lives. The cord blood stem cells – which are adult stem cells and not embryonic stem cells – can be used to treat diseases, such as certain cancers. Researchers also work with cord blood stem cells, which transform into all the different cell types in our bodies, to find new treatments for disease. It might be reasonable to assume that many mothers would jump at the chance to help the human race by banking their cord blood. But of the 4 million births each year in the United States, cord blood is stored in less than 10 percent. Hospitals must have in place a robust and coordinated collection method in order to properly procure and bank the cord blood. Since the vast majority of the nation’s hospitals do not have such a system in place, many mothers who might happily bank their cord blood are unable to do so. Christiana Care, which offers the full spectrum of comprehensive, integrated, high-quality health care services for women, has partnered with the nation’s foremost cord blood banking provider, CORD:USE, to give local mothers-to-be an opportunity to bank their cord blood and rest assured that this tissue will serve a life-giving purpose. Christiana Care’s Labor and Delivery nurses educate expectant mothers about cord blood banking while they are in labor at Christiana Hospital. If they choose to bank, Christiana Care obstetricians and nurse midwives collect the cord blood using CORD:USE’s patented collection kits. Christiana Care health care professionals will then process the cord blood and ship it to premiere institutions such as Duke University for either research or public and private banking. Public banking is free while private banking costs about $2,000 in each case and generally requires an annual storage fee. Humankind is already experiencing the fruits of banking. To date, more than 70 different diseases are treated with stem cells from umbilical cord blood, including leukemia, lymphoma and sickle-cell anemia. In terms of medical research, some of the cord blood units collected will be available for research studies that are intended to help improve patient outcomes through The National Cord Blood Inventory. The National Cord Blood Inventory was created as part of the Stem Cell Therapeutic and Research Act of 2005 with the goal of placing 150,000 new high-quality cord blood units into the inventory to be made publicly available to potentially save the lives of patients in need of a transplant. In addition, the model developed between Christiana Care and CORD:USE is a unique, homegrown effort. While every other hospital that has partnered with CORD:USE does not have their own dedicated staff directing the program, Christiana Care’s CORD:USE program is overseen by one of its own Labor and Delivery nurses, Kim Petrella, RN. CORD:USE also has been internationally recognized for the reliability of its patented storage kits and it is the only major cord blood banking organization whose CEO also happens to be an obstetrician. Christiana Care took this significant step so expectant women can finally have the choice to donate their cord blood in a safe and effective way. Christiana Care is the only health system in Delaware and the Philadelphia-area that has partnered with CORD:USE and since our launch in June, more than 160 families have chosen to donate their newborn’s cord blood. We look forward to partnering with more expectant mothers through this worthwhile and life-saving program. To learn more about donating your baby’s cord blood and sharing the gift of life with someone in need, visit www.corduse.com. You should always consult with your doctor before making important medical decisions. ← Previous Story Helping Delaware Hear Better!